KleenUp® gives complete kill of tough annual and perennial and broadleaf weeds in flower beds, around trees and shrubs, in walks, driveways ,and in gravel or bark ground mulches. This product is formulated to be used as a “spot” application to individual weeds, rather than as a broad spectrum product that is sprayed over an area. This product kills most live plants that it touches so you want to use it very carefully ONLY on those weeds you wish to kill. KleenUp works by moving systemically from the leaves down into the root system. Visible effects are usually apparent in 1 week and most weeds are killed in 1 to 2 weeks. Unlike many other herbicide products, KleenUp is effective because it kills the roots of the plant as well as the parts of the plant above ground. This is a tough, relatively fast acting, waterbased formula of systemic 0.5% glyphosate plus 0.12%Blazer®. 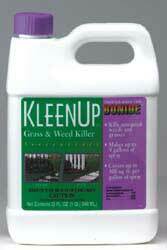 KleenUp kills most perennial weeds. Here are some common perennial weeds controlled by KleenUp. This product comes in Ready to Use or Concentrate form.